Frederick Wilson was born in Warrington, Cheshire, near Liverpool. He eventually came to live in Cookstown. Frederick enlisted in London. 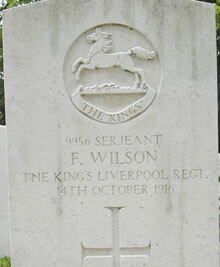 Sergeant Frederick Wilson was serving with the 1st Battalion of the King’s (Liverpool Regiment) when he died of wounds in hospital in England on 14th October 1916. The cemetery is on the main A229 road in Chatham. From London take the A2 south-east towards Kent (Dartford/Gravesend/Rochester), over Bridge Reach, then take the A229 towards Maidstone. Fort Pitt Military Cemetery is on the left hand side of the road.